I was told there would be snacks. Yes, I watched the Super Bowl. No, I don’t care about football. But I am continually amazed by the peculiarities of my species, and those are on display with extra sprinkles during our nation’s annual rite of roughhousing. Love it or hate it, football is entrenched in our culture, almost as deeply as the beer and cars and snack food whose ads support the whole ritual. And, I admit, I enjoy critiquing the Super Bowl ads at least as much as I enjoy watching the game. I mean, breathes there a soul so dead that never involuntarily said “aww!” at the first sight of those Budweiser ads with the puppy and the Clydesdale? Come on! Puppies! Clydesdales! United in their appreciation for American beer, even if that company is now owned by a Belgian-Brazilian corporation. It’s still our beer, right? Well, beer aside, the Super Bowl is over, and now we have to face the rest of February with only Mardi Gras, Valentines day, and the Olympics to distract us from the tiresome work of reality. In Washington, D.C., people pay a lot of attention to the news. And a lot of people in this city are actively involved in trying to change and/or improve the way things work in this country and the rest of the world. There’s always room for improvement. But it’s never as simple as one might hope, it’s rarely easy, and often slow to manifest. That slowness represents a challenge for us humans. We all want instant results. Lose weight fast. Get rich quick. Dominate the market today. Yet there’s an upside to a slower process that allows for adjustments, refinements, and perhaps a closer brush with perfection. It’s hard to stay focused on one goal persistently, day after day, week after week. Everyone needs a break from time to time. Thus, some watch football. 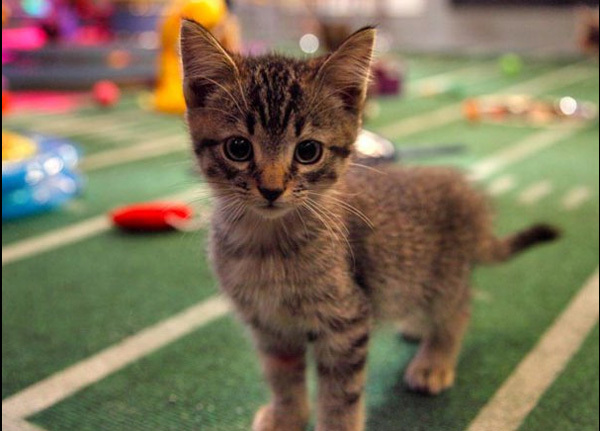 Others prefer the Kitten Bowl, or the Puppy Bowl. In a world where the problems sometimes seem too large to manage and the people in charge appear unequal to the task, it’s important not to lose hope. When my spirit sags I turn to movies. This past weekend I watched “In A World,” Lake Bell’s brilliant and funny film about the curious business of voice-overs. The film has a lot to say about ambition, gender issues and perception, but most of all it challenges the notion that we are all stuck “in a world” where things can’t be changed. Bell makes it clear that even when the game is rigged and the odds are stacked against you, you can change the game. In a world where the Seattle Seahawks can defeat Peyton Manning and the Broncos, it feels like anything can happen.